Please refer to our stock # J1070 when inquiring. 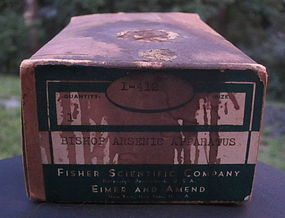 Scientific, chemist, laboratory-- these terms all best describe this circa 1930s, unused and most interesting device labeled "Bishops Arsenic Apparatus". Comes complete with original wrappers, jar, black stopper, piping and stained box with label. The box measures 5.5 inches long x 3.25 inches wide x 2 inches high. Condition is excellent. Perfect for your laboratory, medical or weird science collection!